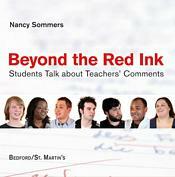 Beyond The Red Ink has its origins in a May 2010 workshop that Nancy Sommers led for the Bunker Hill Community College (Boston, MA) Writing Program faculty-during which a professor asked, “But what if we learned that our students neither read nor understand our written comments?” Sommers set to work interviewing fifty Bunker Hill students-asking them a range of questions about the written comments they receive on drafts, such as why they choose to use some and ignore others as they revise. She then produced this film, which features seven students talking openly about the role that teachers' comments have played in their lives as college writers and offering their own advice — in their own words — to writing teachers. The DVD comes packaged with a booklet that offers tips for using the video both with groups of instructors for professional development and with groups of students for class discussion and reflection. "Write comments that begin conversations, not end them."